Looks can be deceiving, such is the case with developer Ruari O’Sullivan’s title OVERWHELM which doesn’t look incredible, but ends up packing a punch using only black, red, and white colors with the aesthetic. OVERWHELM will beat you over your head with its difficulty over and over again, but with each run, you’ll slowly start understanding its nuances to the point of mastering its simple, yet deep combat mechanics. The story centers around you playing as some sort of knight sent to destroy an extraterrestrial hive. For that to happen you’ll need to beat five bosses in a small Metroidvania map. You’ll have to beware though, as the complications start with your character only having three lives and the ‘game over’ is definitive. Each time you lose all your lives you’ll have to start all over and beat each boss again. Generally, this is a bad concept, as it encourages too much backtracking. Matters aren’t made any easier by only being able to take one hit from any enemy and losing three lives resets all your progress. On top of that, each life lost leads to a slightly dimmer outer edge of the screen, making it even harder to concentrate. Thankfully however, checkpoints are common and each time you die right behind a boss or a specific room, you’ll appear in the room before ready to tackle the obstacle yet again. Each time a boss is defeated and the boss crystal you are trying to collect is brought back to base your lives are reset. It’s in this middle hub area where you can refill your ammo back up to 99 and take a much needed break before embarking down a different path. Fortunately, not only do you have your rifle, which can be fired in short bursts, but a second jump or individual button press will have your character perform a punching attack which is useful defeating weaker enemies. I found the controls to be somewhat wonky though, as I did not like to jump using the L shoulder button, nor punch with the L trigger. Firing with the R trigger while aiming with the right analog stick felt adequate, but in handheld mode, my hands felt very cramped. Regarding the Metroidvania aspect, OVERWHELM is actually rather short and the paths are relatively linear, so it’s neither boring nor confusing from moving to one area to the next. However, each time you defeat a boss the difficulty of the game increases in a unique way. Some cause new enemy types to spawn or even add more enemies to an area and this makes for some clever differences because the enemy positions and types have changed. Additionally, enemy behavior and aggressiveness will also be subject to change leading to an overall more difficult experience. This gimmick might seem unnerving at first, as usually enemies are always located at the same spots and attack with predictable patterns. But in OVERWHELM, even though the areas are small, enemies will always react in different ways never leading to the same experience twice. This is also why OVERWHELM can be immensely frustrating as the difficulty spike without your character leveling up makes the later moments truly, well, overwhelming. I found I was oftentimes more frustrating as you will become more skilled as you play, but it does not offset the difficulty spike associated with each boss defeated. The bosses are a major component of OVERWHELM and just like the enemies they have unpredictable movements and behaviors. For some reason, the bosses will even disappear and reappear multiple times during a fight to disorient you. Due to all these erratic and surprising behaviors, OVERWHELM can be a terrifying and unpredictable experience. All the bosses are also unique in their presentation and have secondary stages that will make defeating them with one life a strenuous, although satisfying affair. Where OVERWHELM shines in its ability to make you feel like you are in control at all times. You can try and grind the same path over and over again, or try different paths until you feel more astute in your skills to tackle all the bosses in one go to complete the game. It’s sort of like Mega Man in a reverse way where in Mega Man you become stronger, but in OVERWHELM your enemies become more difficult to deal with. You just also consider some areas become much more dangerous according to some specific enemy powers and maybe you have to change your sequencing in order to have the easiest path to the final boss. As stated before, one major gripe I have against OVERWHELM is the actual camera. For each death in the series of three lives the sides of the screen will blacken, which reduces sight in an already exceedingly dangerous world. This was unnecessary in my opinion and only added to the frustration in a way that didn’t seem fair or unique in any sense. I get the developer wanted to overwhelm you literally, but this was taking it too far. There were also moments when the camera was not centered around my character, leading to unnecessary deaths by enemies just outside my area of view. I loved the premise of OVERWHELM, but felt in the end it was all too much. This is the type of game that will not appeal to many players, but for those who love deep challenges, OVERWHELM is perfect for you. The minimalistic art style reminded me of Downwell with bright reds and the gameplay mechanics were intuitive, I just wish the controls felt better. 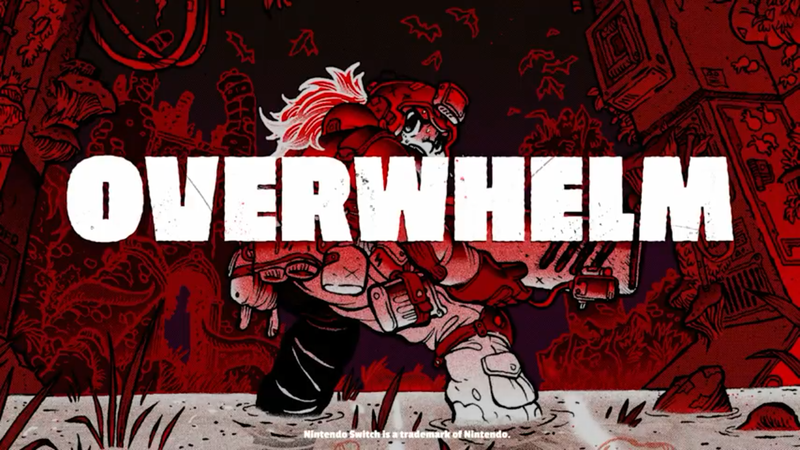 OVERWHELM is hard to recommend unless you are ready for a ridiculous Metroidvania challenge.